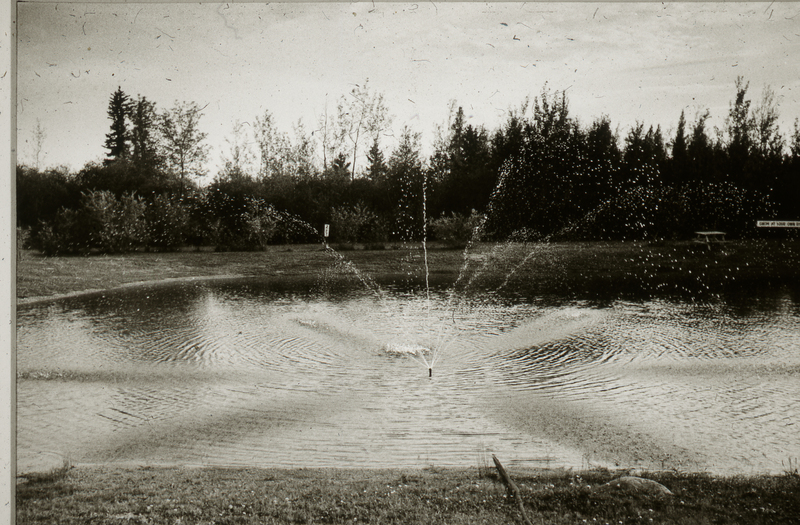 Item is a photograph of a small pond with a water sprinkler. There are two signs in the background: one sign reads "2 FT" and the other sign reads "SWIM AT YOUR OWN RISK." The photograph was exhibited at the Centre for Art Tapes during a 1977 exhibition of photography and video by Bruce Sparks, Vikky Swettenham and Theodore Wan. Copyright is held by Bruce Sparks. Image is disseminated with permission. Description created on December 21, 2015. Some descriptive information was provided by Bruce Sparks on December 21, 2015.